Gosh, The Future Has Arrived! 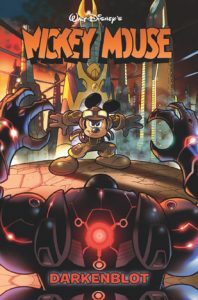 With all this talk about the ducks lately, let’s remember the mouse… IDW have collected issues #16 through #18 of their Mickey Mouse full-color comic as a new single-story-arc graphic novel called Mickey Mouse: Darkenblot. “The future is now! The high-tech city of Avantgarde has a cutting-edge robot police force – but it’s just become the Phantom Blot’s deadly private army! Can Mickey brave high-tech horrors to stop his old foe? Or will Avantgarde decide Mickey is part of the problem?” Created by Andrea Castellan, Jonathan Gray, and Lorenzo Pastrovicchio, it’s available exclusively at comic book retailers in July. Coming in August, Top Shelf Comix bring us this: “Spacebat, the galaxy’s greatest misfit, is pressed into service by three children to battle a mad scientist, his army of ill-mannered robots, and (worst of all) a universe-bending machine. 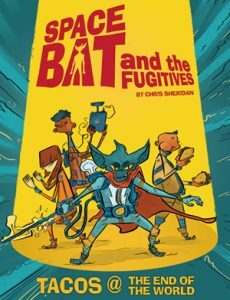 Romp across reality in a wide-ranging escapade for all ages from acclaimed cartoonist Chris Sheridan (Motorcycle Samurai, Plants Vs. Zombies), featuring bold lines, quirky characters, outer-space adventures… and tacos.” Spacebat and the Fugitives Book One: Tacos at the End of the World (whew!) is a full-color graphic novel, available soon in softcover. 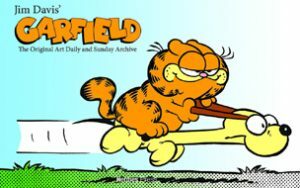 For those with an interest in one of the longest-running (and best-known) funny animal comic strips, Hermes Press have a new Garfield compilation that sure to cat(ch) your eye. According to the publisher: “Hermes Press is proud to announce their second major collaboration with Paws, Incorporated producing another unique title featuring everyone’s favorite orange cat, Garfield! Hermes and Paws have come together to treat the world to a compendium of the greatest examples of original artwork from classic Garfield daily and Sunday comic strips in their original size, including rare unpublished material, that has never been seen before… This historic archival reprint will feature hundreds of pieces of original production art from the comic strip, with an introductory essay from Jim Davis himself! If you love Garfield and want to experience the strips as they were originally drawn, this is the book for you! From the very beginning in 1979 to the last non-digital strip in 2011, this purrfect book shows you Garfield like you’ve never seen him before!” Jim Davis’ Garfield: The Original Daily and Sunday Art Archive is coming in hardcover later this summer. 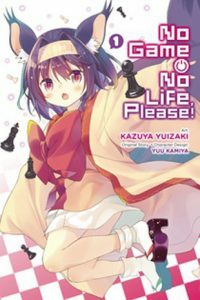 We were not familiar with the anime and manga series No Game No Life by Yuu Kamiya and Kazuya Yuizaki, but it definitely has a furry element to it. And now there’s an even-more-furry spin-off black & white graphic novel called No Game No Life, Please. It goes like this: “In a world where everything is decided by games, adorable little Izuna Hatsuse is a young Werebeast girl who wants to learn more. As she follows Sora, Shiro, and the others, what answers will she find for herself? Let the games begin!” It’s available now from Yen Press. 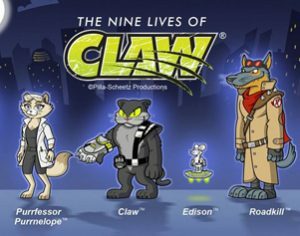 We found this recently on Animation World Network: “Malaysian animation studio Animasia and U.S. prodco Pilla-Scheetz Productions have entered into a co- production agreement to develop 2D animated concept Nine Lives of Claw into a multi- platform brand covering animated series, mobile games, and toy line merchandise. Development work has started with the appointment of Jay Lender (SpongeBob SquarePants, Phineas & Ferb) and the producers plan to showcase the pilot episode in MIP Junior 2017. The Nine Lives of Claw follows the hilarious adventures of the sarcastic superhero cat Claw; his genius (albeit high-strung) mouse sidekick Edison, and the always ambitious kitty Purrfessor Purrnelope as they battle the sinister MUTT (Malicious Unleashed Thugs and Thieves) and a slew of other villains to keep things in order in the fair city of Anonymous.” Long live 2D! We’ll let you know if this gets picked up. 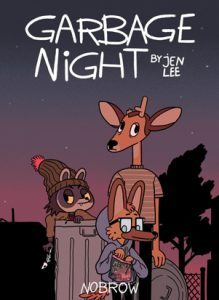 We haven’t heard of NoBrow Press before, but here now they’ve brought us a new full-color graphic novel called Garbage Night. It’s written and illustrated by Jen Lee. Here’s what they say: “In a barren and ransacked backyard, a dog named Simon lives with his two best friends: a raccoon and a deer. The unlikely gang spends their days looting the desolate supermarket and waiting for the return of the hallowed ‘garbage night’ – but week after week, the bins remain empty. While scavenging one day, the trio meet Barnaby – another abandoned dog who tells them about the ‘other town’ where humans are still rumored to live. Spurred on by hunger and the promise of food, the trio joins up with Barnaby and set off into the unknown…” It’s available now in hardcover. The Comics Journal has an extensive preview too. And more stuff from Kingpin Books — this time something much much stranger called Ultra Pig Nipponic Roulette. It’s written by Mario Freitas and illustrated by Osvaldo Medina and Marta Lebre. Here’s what the publishers say, verbatim: “October 10, 1978. 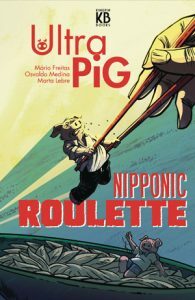 During the twinning cerimony between the Portuguese city of Aveiro and the Japanese city of Oita, the young Ultra Pig is kidnapped by three local businessmen and used as currency in a nefarious partnership with high-ranking officers of the Yakuza. Fearing for his son’s life, the illustrious Calouste Pig risks to face alone the bizarre joint-venture, but ends up getting caught in a very unusual sort of roulette. A very bizarre and very deadly game of roulette, like something out of a Tintin book, but on a cocktail of Manga influences and a ton of crazy.” It’s also coming this December in hardcover, says Previews. 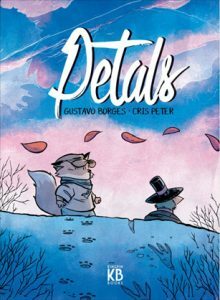 A new talent we’ve discovered thanks to Previews: Writer and illustrator Gustavo Borges, with his new full-color graphic novel Petals. (Fun fact: Mr. Borges used to compete for Brazil in several Olympic Games as a swimmer!) “During a long winter, a family of foxes struggles to survive the merciless cold. One day, one of the cubs leaves his house looking for much-needed firewood and crosses his path with a tall and peculiar bird wearing a singular top hat. A beautifully illustrated and deeply touching story of friendship and selflessness by young Brazilian prodigy Gustavo Borges and Eisner Award-nominee colorist Cris Peter.” According to Previews, Petals should be out in hardcover this December. Looks like the school pets have been busy again. 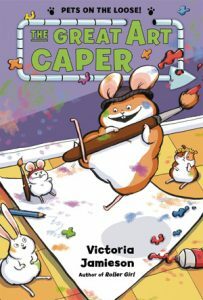 Now the publisher Henry Holt has brought us The Great Art Caper, once again written and illustrated by Victoria Jamieson. “A follow-up to The Great Pet Escape [which we talked about last year]. This time, our favorite class pets have to save the school art show! Things at Daisy P. Flugelhorn Elementary School have been quiet-too quiet. Cuddly yet calculating class hamster GW spends his days in second grade and his nights poetry slamming and jigsaw puzzling with his friends, Sunflower and Barry. GW has even started warming up to the second-grade students, a girl named Carina in particular. Could he be making a human friend? After Carina is selected to participate in the school art show, GW decides to make her a gift in a show of support. But he soon learns of a dastardly plot – Harriet and her many mouse minions are planning to ruin the art show! Once again, it’s up to GW, Sunflower, and Barry to put a stop to Harriet’s mousey madness. ” It’s available now in hardcover or softcover. Check out the preview at (where else?) Previews.